Gr. 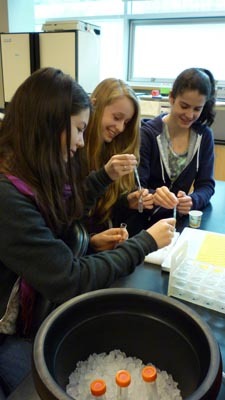 9's study their own DNA at Michael Smith Laboratories, UBC. 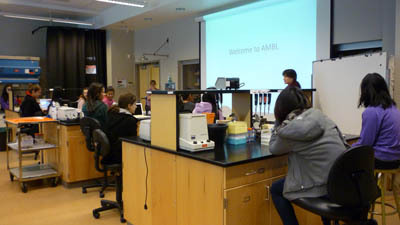 On February 9th, the Grade 9 girls had the opportunity to visit the Michael Smith Laboratories and experience a day as scientists at UBC. The program, hosted by the Advanced Molecular Biology Laboratories, allowed us to participate in fun and interesting activities. We were able isolate our own DNA and to explore the newly built Beaty Biodiversity Museum. During the past couple of months, the Grade 9’s have been studying the cell and how it functions. This field trip really helped us to understand how our bodies operate and allowed us to interact with “real” scientists at UBC. The first activity involved isolating DNA from our cheeks. Using a combination of salt water, SDS, and ethanol, we were able to see our DNA. Everyone was very surprised to see what our DNA actually looked like in real life. It looked quite different in the test tube than in our science textbooks and models at school! The second activity was exploring the Beaty Biodiversity Museum. This museum displays UBC’s natural history collections, which includes more than two million specimens. Among the exhibits were the second-largest fish collection in Canada, fossils, shells, mammals and plants from British Columbia and around the world. The entrance boasts a 26-foot blue whale skeleton. After the initial tour, we participated in a scavenger hunt and discovered facts about the exhibits from the staff. Not only did we participate in workshops, but we also had the opportunity to listen to a presentation by Dr. Phil Hieter, a geneticist at the University. Dr. Hieter is a world-renowned scientist who is a leading researcher in gene mutations in yeast. Yeast has proven to be an excellent model for the study of mutations, as it is quite similar to a human cell. His research can be useful for developing strategies for cancer therapies. Overall, the Grade 9 field trip to UBC was a great success. Not only did we have a great time as a class, we gained new information and experienced “a day in the life” of a scientist at UBC.